Join in on the fun with this recreational league. A 12 inch softball will be used and double-headers will be played on Sunday afternoons beginning September 8th. Drop in Adult Volleyball. Must be 18 to play. 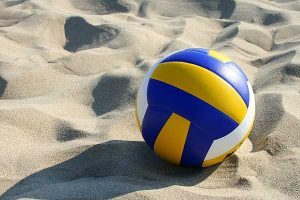 Join in on the fun with this recreational Sand Volleyball League. Beginning Sunday, May 19th. 12 Player Roster 6 play. Players must be 18 years of age. Deadline is Friday, May 10th with a mandatory captain’s meeting on Tuesday, May 21st at 6:30 pm. Sunday matches at 3, 4, 5 and 6. 1 Match per Sunday. 1st Eight paid teams will be accepted. Join in on this 12” recreational co-ed softball tournament. We will follow the same rules as our Fall Co-ed League. A Round Robin followed by a single or double elimination format will be used. Players must be 18 years of age. Deadline is Friday, April 19th with a mandatory captain’s meeting on Tuesday, April 23rd at 6:30 pm. 1st FOUR paid teams will be accepted. APRIL 27th and/or April 28th are game dates. Bring back the sport of your youth. Get your kickball team together and have some fun. League will consist of 6 games plus playoffs. League will consist of 6 games plus playoffs.